A mattress topper is a thick layer of padding placed directly on top of a mattress. The purpose of a mattress topper is to provide an extra layer of comfort or support. Purchasing a mattress topper is a popular way to adjust the firmness or softness of a mattress that may not suit a sleeper ideally, or to extend the life of an old mattress which has started to sag or buckle. Mattress toppers come in a variety of shapes and sizes and are made from materials such as memory foam, cooling gel, down, latex and wool. Choosing the right mattress topper depends on the type of sleeper, a sleeper’s weight, and personal preference for comfort. Even after taking all of this into account, some mattress toppers are simply better than others. We’ve researched mattress toppers of all types and consulted thousands of real customer reviews to create our list of the best mattress toppers available today. There are a variety of styles and comfort options to choose from when shopping for a mattress topper. Let’s take a look at the most popular. Memory foam: Memory foam mattress toppers are the most popular variety among consumers. This topper is made from natural or synthetic viscoelastic foam that is designed to cradle the body and support the back, neck, and joints. Memory foam toppers vary widely based on brand. Some are denser and increase firmness, while others are designed mainly for comfort. 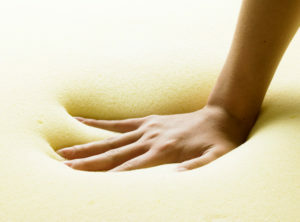 Sleepers who suffer from joint pain or lack support may want to consider a memory foam topper. Cooling: Cooling mattress toppers are normally made from cooling gel or special fabrics that help to circulate air and diffuse heat. The comfort provided depends on the material. Memory gel toppers will provide firmness and support, while fabric options will be softer. For a more in-depth look at these toppers, check out our complete guide to the Best Cooling Mattress Toppers. Latex: Latex mattress toppers are foam-based and organic. They have similar benefits to memory foam but are cooler and a have a bit more bounce. Latex toppers are reported to provide support and decrease aches and pains caused by old or inadequate mattresses. They also come in a variety of thickness and firmness levels. Latex toppers are recommended for heavier-weight sleepers who need support but don’t want to sacrifice the ease of mobility that comes from added bounce. Down (feather): Down mattress toppers offer added comfort at an affordable price. They are lighter weight than foam toppers and typically lower in cost. 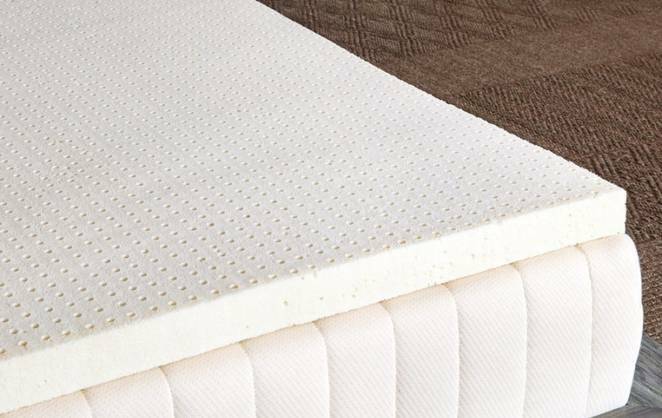 Down toppers are known to add comfort to mattresses that sleepers find too firm. Although they are not as reliable at providing extra support, down toppers are said to sleep cooler than other options. These toppers are recommended for sleepers who don’t need added support but who may have a mattress that sleeps hot. Wool: Wool mattress covers are known for their durability and comfort. They typically last a long time and effectively add comfort regardless of the season. They don’t retain heat in the summer and insulate well in the winter. Like down toppers, wool toppers are more effective at adding comfort than support. They also tend to be more expensive than other toppers. Wool toppers are for sleepers who want to spend a bit more for optimal comfort, breathability and insulation, but who don’t need don’t need extra support. Fiber: These toppers are ideal for sleepers who seek the comfort of down or wool but who may suffer from allergies. Fiber toppers provide comparable comfort to down or wool but without the components that can trap allergens. They are also less expensive than their down and wool counterparts. Before going further, it’s important to understand the difference between mattress toppers, mattress pads, and mattress protectors. They may sound similar and even look similar in their packaging, but they are actually very different products. Mattress pads are less expensive than mattress toppers, but they add a very limited level of comfort. They are made from a variety of materials such as foam, cotton, bamboo, polyester and more. Pads typically tuck into a mattress and offer a mix of protection and light comfort improvement. Toppers, by contrast, lie on top of the mattress and normally don’t tuck in. They are designed exclusively to increase comfort and are much thicker than mattress pads. Mattress protectors are less expensive than mattress toppers and mattress pads, but they are not designed to add any comfort to a mattress. 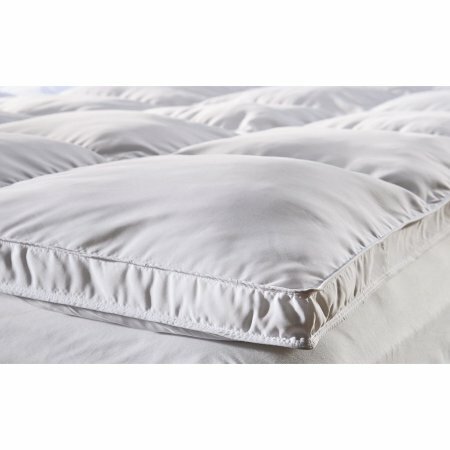 The purpose of a mattress protector is to shield a mattress from wetness and/or allergens. Mattress protectors are made from materials like cotton, polyester and vinyl, or sometimes a combination of these. Unlike mattress toppers and pads, which are designed to change the feel of a mattress, mattress protectors will go unnoticed by the sleeper. Find the best mattress protectors in our full guide to mattress protectors. Mattress toppers can dramatically alter the feel of a mattress, but this doesn’t mean that they are for everyone. Consider these pros and cons to determine if purchasing a mattress topper is the right choice for you. Added comfort: Mattress toppers add up to 5 inches of additional comfort. Increased firmness: Mattress firmness can be changed at a low cost by adding a mattress topper. Increased mattress life: A mattress topper can add years of life to a well-worn mattress. Great for couples: Mattress toppers can be added to just one side of the bed, meaning couples can have two different comfort styles on one mattress. Topper movement: Mattress toppers lie directly on top of a mattress, so they may bunch up or move around over time, causing discomfort. Edge support: Toppers are slightly smaller than mattresses, so sleepers who sleep at the edges of a mattress won’t find them effective. Heat retention: Mattress toppers, especially foam and latex, may decrease or negate the breathability of the underlying mattress. Limited effectiveness: A mattress topper is not a cure-all. Sleepers who experience high levels of discomfort or who have severely worn mattresses won’t solve their problems by purchasing a mattress topper. 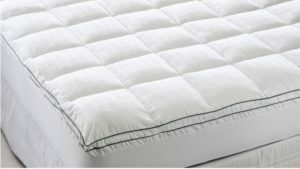 What type of sleeper should consider a mattress topper? Most sleepers who suffer from minor to moderate discomfort through the night can greatly benefit from a mattress topper. These types of sleepers should consider a topper. Couples: Most couples have different sleep styles and comfort needs. A mattress topper placed on one half of the mattress can allow both sleepers to personalize their comfort. Hot sleepers: Sleepers who wake up throughout the night feeling hot can easily solve their problem with a cooling mattress topper. Sleepers with aches and pains: Some sleepers suffer from having a mattress that is too soft, while others suffer from having one that is too firm. Choosing the firmness that’s just right isn’t easy when purchasing a mattress. 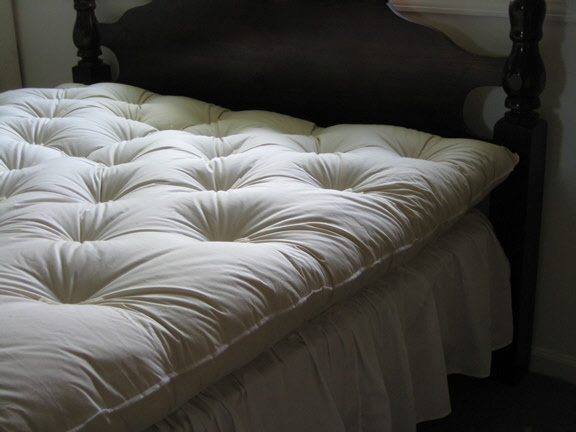 Adding a topper can increase the firmness or softness enough to suit a sleeper’s particular needs. Sleepers with allergies: Naturally hypoallergenic mattress toppers like latex and memory foam options can alleviate allergies and prevent dust mites. Our list of the best mattress toppers was compiled after careful research. 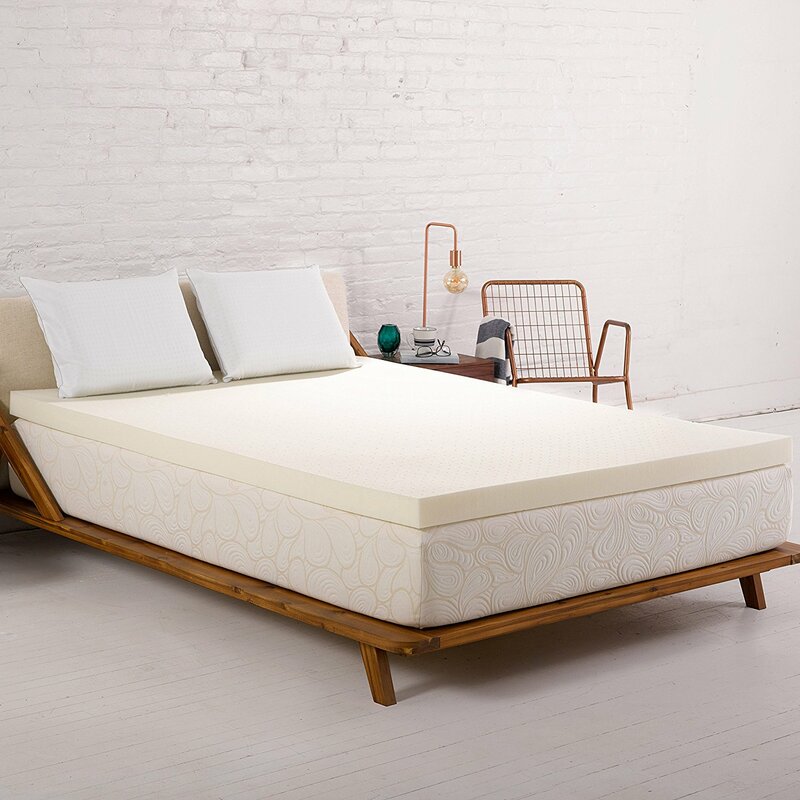 We’ve reviewed thousands of customer accounts, consulted with mattress topper brands and manufacturers, and pulled from our own testing data to arrive at this list of our top picks. The SleepJoy Visc02 Ventilated Memory Foam Mattress Topper combines the comfort of supportive, viscoelastic foam with advanced ventilation technology to provide a cool night’s sleep. Support: This topper is 100% memory foam and provides the cradling support that the material is famous for. Pressure relief: The SleepJoy Visc02 helps to align the spinal cord, thereby relieving tension and pressure points that cause back, neck, and joint pain. Sleeps cool: Memory foam typically sleeps hot, but this topper is made with open-cell construction and is ventilated to decrease heat and promote airflow. Environmentally friendly: The SleepJoy Visc02 is made from CertiPUR-US certified memory foam. This type of foam is made from plant-based compounds and is better for the environment than other synthetic memory foams. It also decreases the initial odor that some memory foam toppers let off. The SleepJoy Visc02 Ventilated Memory Foam Mattress Topper is an ideal choice for sleepers who need the support of memory foam but who also overheat at night. Most mattress toppers are unable to provide both great support and optimal breathability, but the SleepJoy Visc02 has rated highly in each of these areas. This topper comes in 2-inch and 3-inch thickness options. Purchase the SleepJoy Visc02 Ventilated Memory Foam Mattress Topper from Amazon. The LUCID Gel Memory Foam Mattress Topper is another topper that combines the comfort of memory foam with heat diffusion. It differs from the SleepJoy Visc02 in its feel and construction. The LUCID is made from gel memory foam, which absorbs and diffuses heat. This topper is also softer and lighter than other foam toppers of its size. Temperature control: Specially designed memory foam gel captures and releases heat to provide a cool night’s sleep. 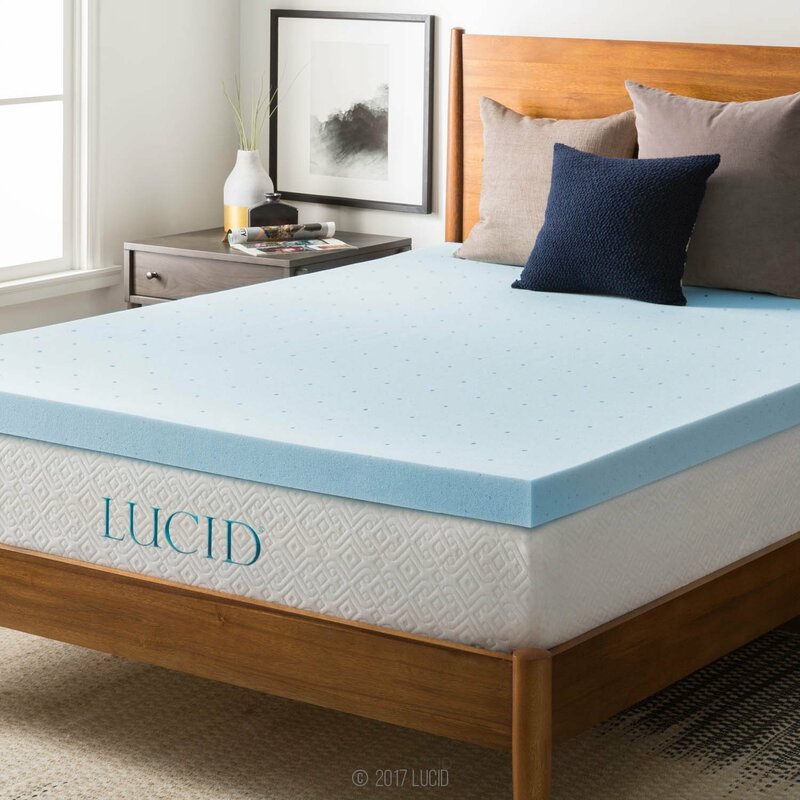 Support: At 3 inches thick, the LUCID offers the full cradling support and pressure relief of memory foam regardless of the type of mattress it’s placed on. Comfort: This topper is made from a combination of memory gel and special foam to create a very soft, comfortable surface. Lightweight: The LUCID is lighter than other memory foam toppers. This renders it easier to adjust, clean, and transfer. The LUCID Gel Memory Foam Mattress Topper is special in that it offers excellent support and temperature control while providing an exceptional level of comfort. 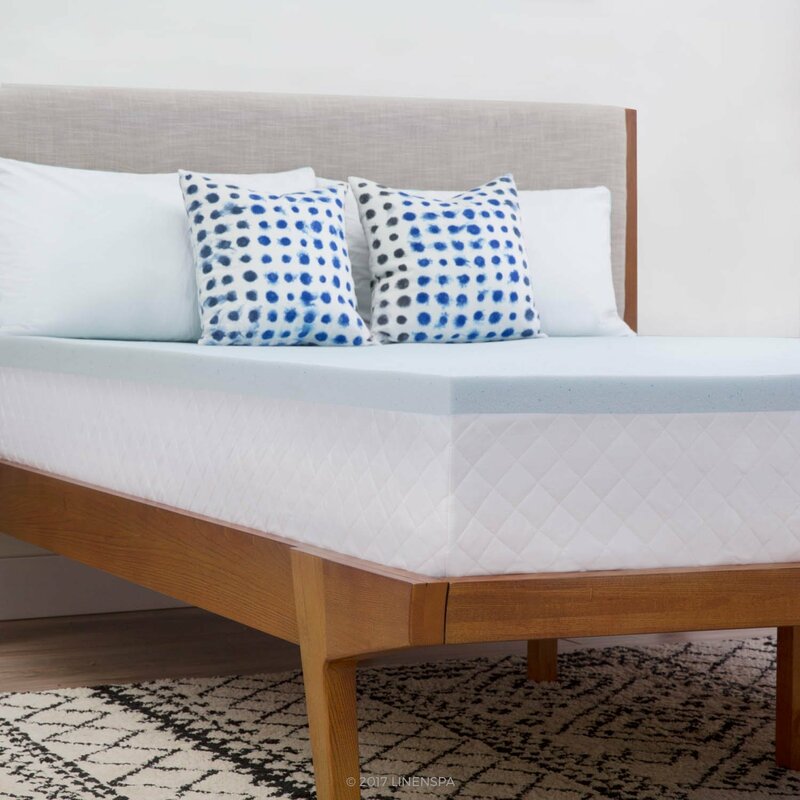 This topper is recommended for side sleepers or combination sleepers who may feel hot throughout the night, or to anyone who wants to add some softness to their mattress without sacrificing support. Learn more or buy the LUCID Gel Memory Foam Mattress Topper from Amazon. 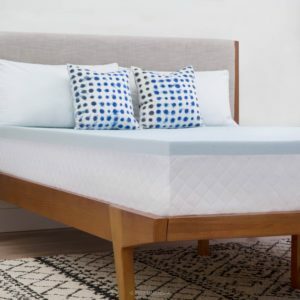 The Sleep Innovations Dual Layer Mattress Topper combines two 2-inch layers into one mattress topper in an attempt to meet the needs of any sleeper looking to enhance their comfort. According to customer accounts, this topper succeeds at just that. A 2-inch fiber layer rests atop a 2-inch gel memory foam layer to combine optimal support with breathability and comfort. Versatile: This dual-layer topper is ideal for all types of sleepers, from those who seek comfort to those who need support and spinal alignment. Temperature control: The top fiber layer keeps cool and insulates well in the winter. The bottom memory gel layer is designed to ventilate heat and regulate temperature. 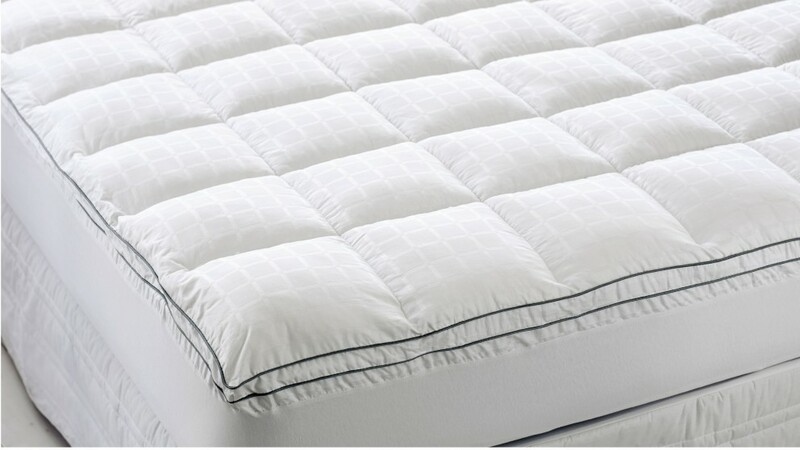 Easy to clean: The Sleep Innovations Dual Layer topper is encased in a quilted cover to ensure that the layers won’t separate. The cover is removable and is washer- and dryer-friendly. 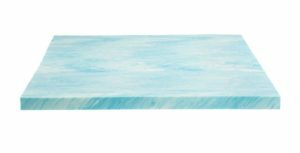 Thick: At 4 inches, this is one of the thickest mattress toppers available, meaning it can help revive even more severely worn mattresses. Warranty: The Sleep Innovations Dual Layer topper comes with a 10-year warranty, which is much higher than the industry standard. The Sleep Innovations Dual Layer Mattress Topper is more expensive than other toppers, but it offers the best of multiple varieties in one package. This would be a good choice for couples who have different needs but would rather purchase one topper instead of two twin toppers. This type of topper is also recommended for sleepers with thin mattresses who want to enhance thickness and support without buying a new mattress. Visit Amazon to purchase a Sleep Innovations Dual Layer Mattress Topper. The LINENSPA Gel Infused Memory Foam Mattress Topper is a 2-inch memory foam topper made from CertiPUR-US certified memory foam infused gel, which is designed to enhance any mattress by adding an additional supportive layer. The LINENSPA is consistently one of the highest rated mattress toppers because it provides excellent support at an affordable price. Support and comfort: This memory foam topper delivers firm support and plush comfort to a mattress. 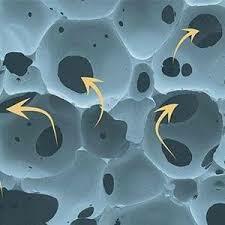 Cooling technology: Gel-infused memory foam absorbs heat and regulates temperature to prevent overheating. Warranty: The LINENSPA comes with a 3-year warranty. Affordable: Memory foam toppers are typically more expensive than others. The LINENSPA is much more economical while providing the same high-quality benefits. The LINENSPA Gel Infused Memory Foam Mattress Topper is a good option for those with minor discomforts or mattress problems, or for sleepers who want to try out memory foam at a low cost. As this topper is quite inexpensive, lightweight, and warrantee protected, it’s also a good choice for people who move frequently, like students. The LINENSPA Gel Infused Memory Foam Mattress Topper is available now from Amazon. 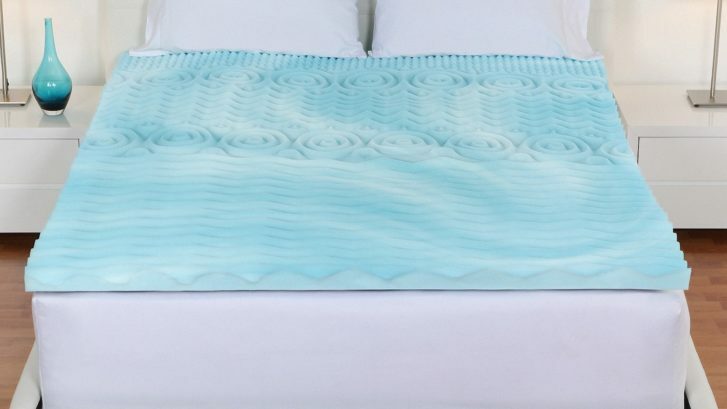 The DreamFoam Bedding Gel Swirl Memory Foam Topper is an environmentally friendly, visco-elastic foam topper which excels at adding plush comfort to a mattress. This 2-inch thick topper is infused with gel to facilitate heat diffusion and is made from high-quality CertiPUR-US certified memory foam. What sets this topper apart, according to thousands of satisfied sleepers, is its optimal combination of softness and support. Soft yet supportive: Many memory foam toppers sacrifice firm support for soft comfort. The DreamFoam Bedding Gel Swirl has found a balance between the two. Relieves pressure: Soft memory foam cradles and relaxes joints and muscles while keeping the spinal cord aligned. This topper is reportedly effective at relieving aches and pains. Eco-friendly: The DreamFoam is made from natural CertiPUR-US foam to help protect the Earth. Warranty: This gel memory foam topper comes with a 3-year warranty. Even at 2 inches thick (about the average thickness for a memory foam topper) the DreamFoam Bedding Gel Swirl Memory Foam Topper outperforms many other thicker and more costly options. Sleepers who have benefitted from this topper include heavier or overweight sleepers who need additional contour support as well as stomach sleepers who benefit from spinal alignment in the lower back. Apart from these recommendations, it should also be noted that this topper has tested well with all types of sleepers. Visit Amazon for more information or to purchase a DreamFoam Bedding Gel Swirl Memory Foam Topper.